The Coupé series of table, wall, and floor lamps was initially conceived as a variation of the designer’s Spider family with which it shares its disc-shaped base and tubular stem. Coupé’s simple diffuser is attached to the stem allowing tremendous flexibility for the user to direct light by sliding the diffuser downward or adjusting it sideways. Coupé is available in two distinct diffuser variations – one is drum-shaped; the other is a hemisphere. Each version has Colombo’s signature, engaging “slits” in the top. Noted here is the Coupé floor lamp with drum-shaped diffuser. 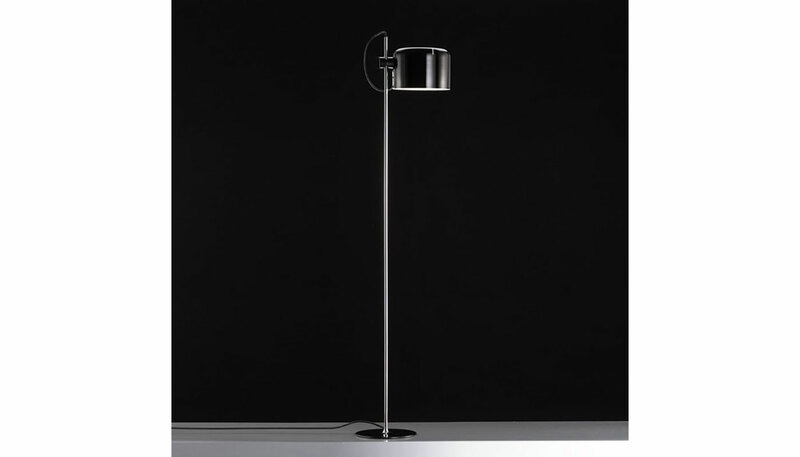 Base and stem are constructed of chrome-plated steel; diffuser is composed of aluminum with a choice of exterior finish. Coupé is part of the permanent collections of several museums worldwide including New York’s Museum of Modern Art and Munich’s Die Neue Sammlung. Manufactured by Oluce.